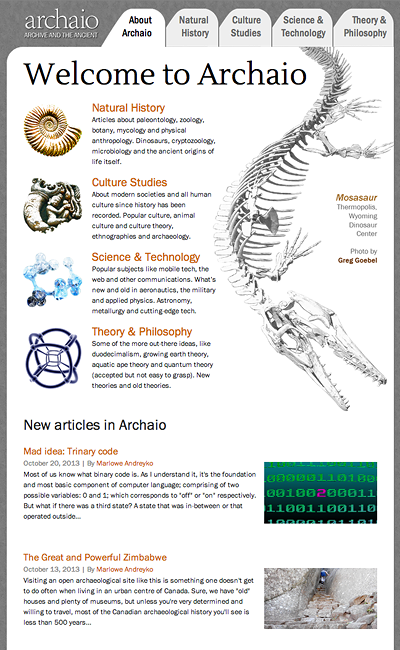 After many months in the making, my new website, Archaio.org, is finally done! I’ve long been interested in paleontology, the study of dinosaurs and other ancient life but more recently become passionate about physics, technology and culture studies. Ever had a crazy theory in your head and forgotten it later. This is the kind of situation I hope to avoid by committing these ideas, ramblings and musings online where everyone can see it. This site is not meant to be like a scientific journal, I’m not qualified to do that. Rather it’s a place where I and other like-minded enthusiasts or guest bloggers and post their professional or layperson ideas and questions about the natural world, philosophy or culture. Right now it’s just me on there but I hope to be joined by a couple of others to wonder about the world. Want to be a contributor? Yes I do! That is fantastic. Great looking site as well.